How to Choose Best Grain Free Foods for Your Cat - Play With Meow! Grain-free cat food is becoming popular nowadays and widely selected among pet owners. The question is, is it good for pets? There are a lot of researchers believed that a grain free cat food is ideal for cats because they are carnivores. As a matter of fact, most cats love grain free cat food. What is a Grain Free Cat Food? What are the Benefits of Grain Free Cat Food? Can Cat Able to Digest Grains? Why Do We Consider Grain-Free Cat Food a Better Option? How Pet Owners Figure Out if Their Cat is Sensitive to Gluten? What Do You Need to Consider Before Purchasing Grain-Free Cat Food? 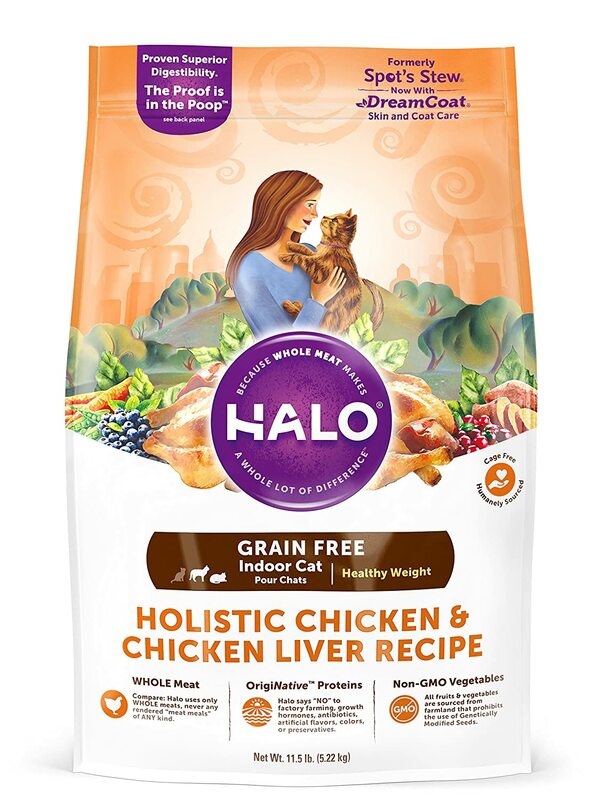 Where to Buy Grain-Free Cat Food? What is the most important factor is giving them a kind of food that offers a complete and well-balanced nutrition? If the cat food lacks of specific nutrients, our cats will suffer in the end. Grains such as soy, corn and wheat are likely hard to digest for animals particularly cats. It can also cause skin irritation so it is suggested to use grain free cat food. However, some pet food manufacturers still include grains in their products because it is inexpensive and they believe that it adds the needed nutritional content to the food. Selecting a grain free cat food is good, but it is essential to know what is the substitute nutritional component of grains in their products. Another thing is, a cat with the diabetic condition must eat a high protein and low carbohydrate diet but grain-free cat food may not always a good option for them. One good benefit of this cat food is, it is good for cats with grain allergies or having a hard time digesting grain food diet. Other signs may appear for food allergies are chronic diarrhea, flatulence, continuously licking their paw and itchiness on their back. If any of these signs are present, make sure to take them to the vet for proper assessment. They are the ones to confirm for possible allergic reaction and what food is causing the reaction. Although it is the grains such as corn and wheat can cause food allergies, there might be other sources of reaction. Using a grain-free cat food may prevent the occurrence of this problem. The same thing with humans, if the cat eats an excess amount of carbohydrates without acquiring daily exercises to burn carbs will end up experiencing weight gain which is not healthy at all. The majority of grains have a lot of carbohydrates and giving this to your cat will not help at all. Using a grain-free cat food controls the weight. Other well know feeding method that we often encounter with grain free cat food is feeding with high protein diet and low carbohydrates. It is better not to assure that a grain free cat food is a low carbohydrate diet. As a matter of fact, some grain free cat food may consist of carbohydrates which is similar or sometimes, even more higher than food with grains. In the most type of grain free food, some ingredients you can see are potatoes which substitute the grains in the food and most of the time, these ingredients have more carbs compare to some common type of grains used in cat food. In the end, grain free diet and low carbohydrates food care not always similar to each other. One common myth about grain free cat food is that it consists of high protein element. It is true that protein is essential in cat food because compare to any other animal, protein is very important source of energy. Some pet owners are not aware that although cats need a protein element coming from other animals, their body system is also good in absorbing and digesting high-quality nutrients coming from plants. As a matter of fact, a kind of cat food that depends entirely on meat as a source of protein is rich in phosphorous as well. Even though phosphorous is one of the most important nutrients, it is also associated with the development of kidney problems in animals especially cats. Grains and vegetables consist of the small amount of phosphorus which also providing your feline friend the protein he needs in order to maintain overall well-being and health. Pet owners frequently observe an improvement in their cat’s digestive health when shifting to a grain free cat food. This kind of diet is usually premium food that consists of high-quality elements in general. Changing of cat food is also means changing of preparation that includes a lot of a different number of ingredients. By using grain free cat food, pet owners may lessen the risk of getting a food allergy. Place your cat on a grain free diet. After your cat has been settle, add a small amount of pasta to their food. If your cat does not encounter gastrointestinal upset, they are not allergic to gluten. In this way, they can be allergic to something else either from the old cat food or it can be anything that is not related to any kind of cat food. If the cat food is grain free diet, which can be good for a lot of reasons, you may want to know and check how the food manufacture has established to replace the missing grains. You may want to point out for a balanced distribution of fats, carbohydrates, vitamins, proteins and minerals. Check the ratio of each element per serving. Consider the activity level of your cat and lifestyle. From this, you can base the kind of food you need to give and make a big difference. Outdoor cats love to eat what they can see outside such as small rodents, birds, mice and etc. They are able to get nutrients from these foods. If they eat additional snacks which are the cat food, it is important to monitor any possible weight gain. If they love to roam around your backyard, it’s a good practice to burn calories. In this way, you don’t need to worry as they are eating on the proper condition. Indoor cats do not get enough exercise always. In this way, pet owners must be very careful in giving the kind of cat food as a regular diet. If you have an overweight cat that needs an extreme diet, you can also use grain-free cat food that doesn’t give your friend a large amount of calories. It can be worth trying after all. Always consult your vet about getting a grain-free cat food whether it can be a good option for your beloved cat or not. Ask for brand recommendations. When deciding to purchase these kind of cat foods, be careful not to be deceived by the labels that say their product is all natural or promise to give your feline friend more nutrition compare to other products available in the market. Always check the ingredients and nutrient composition at the back of the product. Ask the vet before changing a new kind of diet. 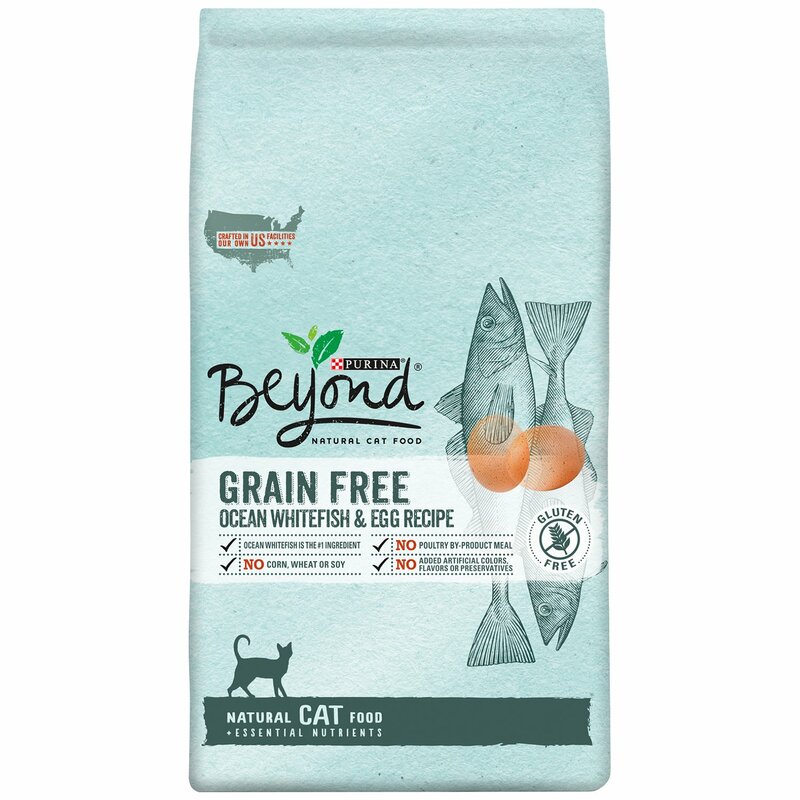 Purina Beyond Grain Free is rich in essential nutrients that your cat may need. It consists of simple ingredients in providing essential nourishment to help your friend live a healthy and happy life. It has a mixture of tasty white fish, eggs, vitamins and minerals. 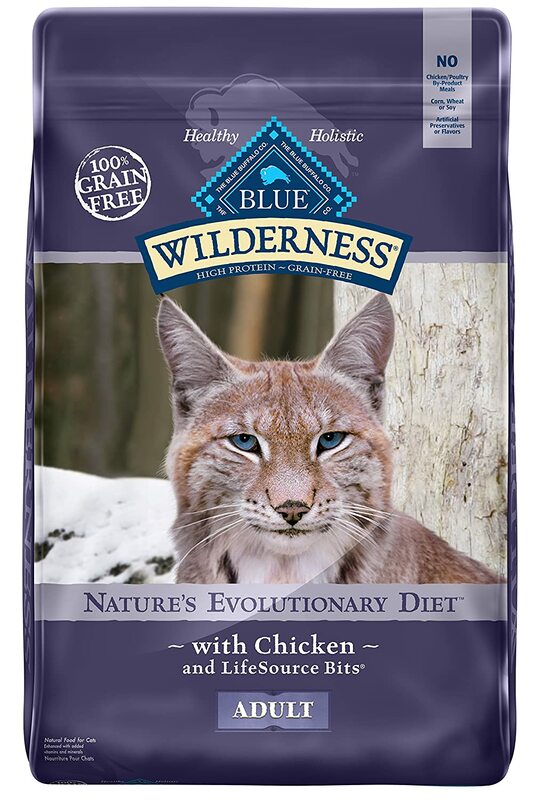 Influence of the diet of the lynx, a wild family of feline species. This cat food is rich in protein which consists of the high-quality concentration of chicken meat that most cats will love. It also contains turkey, sweet potatoes, carrots, blueberries and cranberries that will keep her active and beautiful. 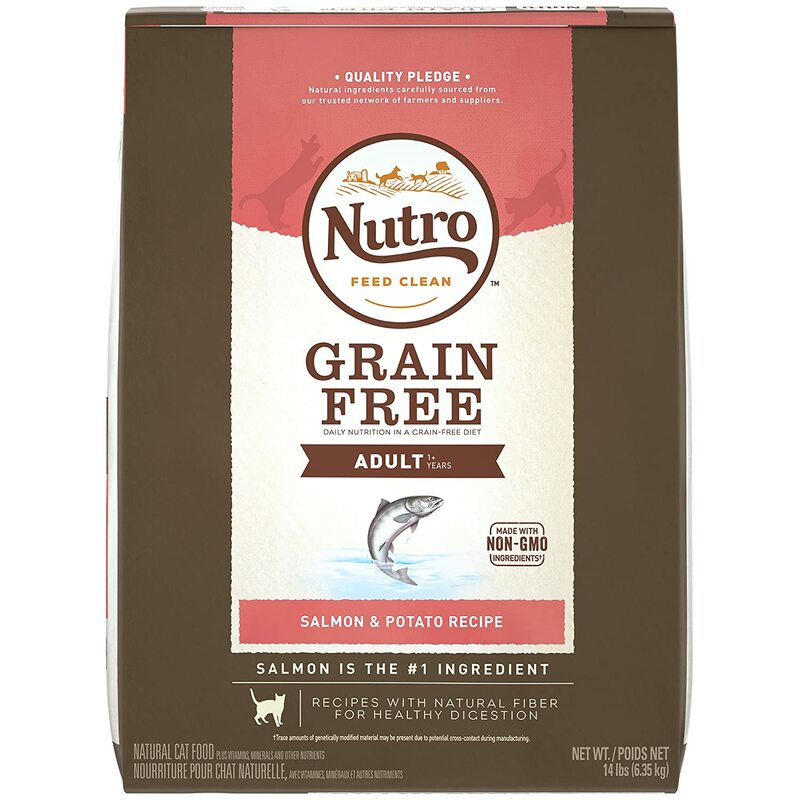 Nutro Grain Free Cat Food consists of high-quality nutrition, non-grain carbohydrates which is good for easy digestion and energy. It is made with natural fibers to maintain soft and shiny fur. The main ingredient use in this product is a real white fish. Halo Spots Stew Grain uses only whole meat protein. It promotes easy digestion and provides nutritional need to your cat. It is made with high-quality chicken meat, whole egg and vegetables. It will make your cat look beautiful inside and out. The product’s main ingredient is fresh chicken that sustains high-quality protein in keeping your cat’s weight in good condition. It comes with great taste and nutritious elements to promote long and happy life. We are often asked what brands we recommend. It is true that there are many kinds of cat food on the market that sounds very nice and healthy according to the label it says, but when you take a deeper look on the product label, you realize that there is not enough nutritional need beyond the marketing strategy. Also, using grain free cat food can help your cat achieve a soft fur and a healthy skin because of omega fatty acids in consists. In this way, you would always love to cuddle your feline friend as you watch a movie on the couch together. 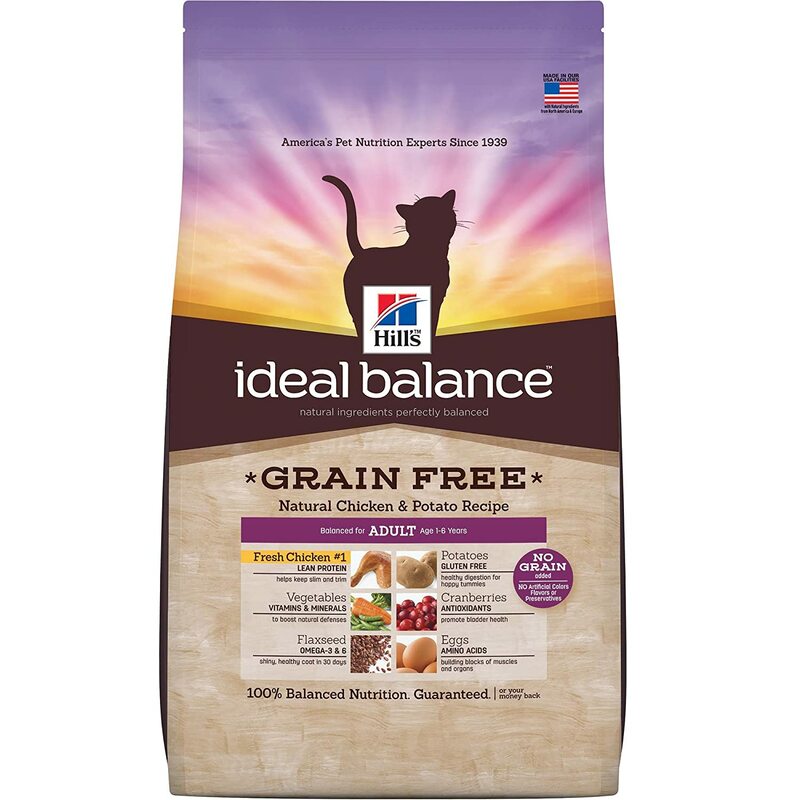 Our product recommendation is Purina Beyond Grain Free. It seems to provide good nutritional balance and uses a real ocean whitefish. If you think you have different necessity, make sure to check the other lists from this article. Always maintain a well-balanced diet on your cat which is essential in their overall health and wellness. Every cat is different, so their kind of diet must come with different consistency, ingredients and nutrients. To find the best cat food, you can never go wrong with dry, wet or gain free diet. Each of these types of cat food provides your friend the essential nutrients they need; one may differ from the other when it comes to your cat’s specific needs. The best thing to do is consult this to your vet and check out our reviews above.